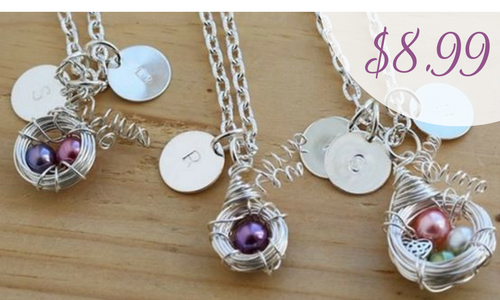 Through tomorrow (12/8), you can get a beautiful Bird Nest personalized necklace for just $8.99! These are regularly $19.99, so this is a great deal. Note: these usually sell out quickly so don’t wait on this one. These necklaces make great gifts and you can customize them with up to 6 pearls and 6 initials in any combinations you like. Plus, you can choose from gold, bronze or silver wire. Keep in mind that you do have to pay for shipping which is $1.99 for the first necklace and then 99¢ for each additional one. This also should arrive by Dec. 22 so will should get it in time for Christmas.